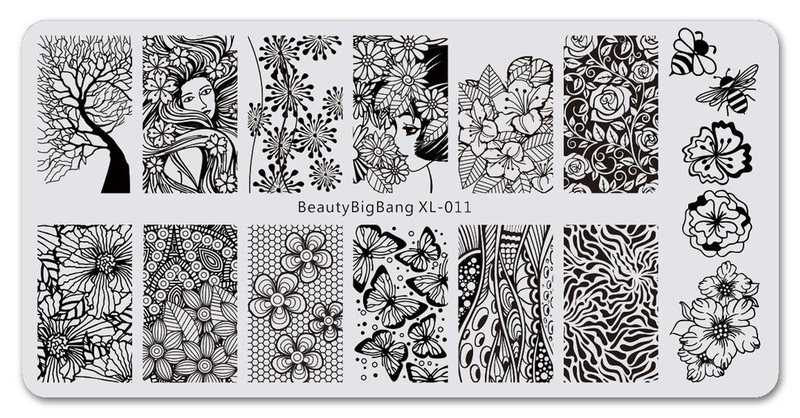 My final review for the latest batch of what Maggie from Beauty BigBang sent to me is Beauty BigBang’s XL-011 stamping plate. Now I was originally supposed to review this stamping plate along with the batch I painted in October, but there was a problem with one of the images. It was missing lines! So I contacted Maggie and she told me to hold off the review and they’d send me a new plate in the next batch and so they have. On the one hand, it sucked to have to delay my review. On the other, it’s always nice to see how a company acts when things go wrong and to have a weird kind of proof that I’m getting the same items that anyone else would (Jess from Nine Zero Lacquer has noted that sometimes what she gets as PR is not the final product, so it happens). Now I’m sure they’d just send a new plate straight off to a paying customer, but I’m a reviewer so I had to wait. Such agony. 😉 Now let’s take a look at the images, shall we? 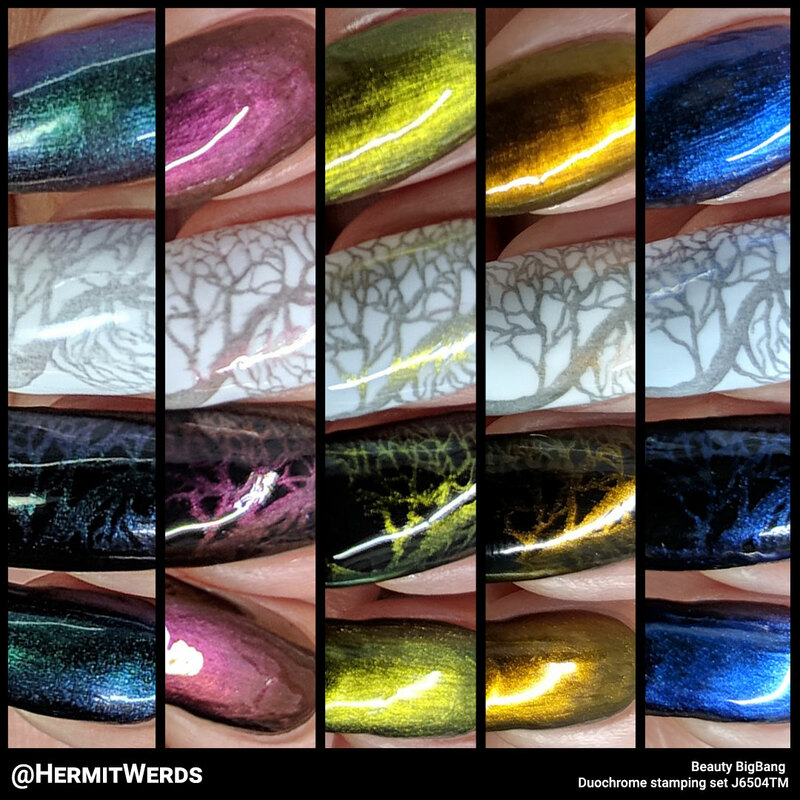 Did you recognize the tree that I used in all my stamping swatches yesterday? I really like that one and since it’s so big you can really change up how it’s positioned for a different tree on each nail if you like. I like both of the images with hoomans (BBB also has a stamping plate of all girls). Individually I like just about every image on the plate. But. Not one floral really matches another except for two single flower images on the side and that annoys me. I know I am picky in ways that others are not and I did find some similar flowers on this plate [Edit 1/4/2019: I should have checked the square plates; J6401TM-4A is an even better floral fit.]. Still. Those single flower/bee images on the side could have helped bring the whole plate together and it ended up just being more random. Well, I still asked for this plate so you know I liked what I saw. Another example is the abstract kind of splatter-y floral pattern. That easily transitions to Christmas if you use the right colors. And the butterflies can be plucked from the full image and matched with most of the other floral patterns if you’re not into the bees. Also, that alien 3D pattern…I am not sure why it was included on a floral plate, but I love it. If you couldn’t tell that I love bugs, I think what I chose to use for my samples makes it pretty clear. Buuuugs. 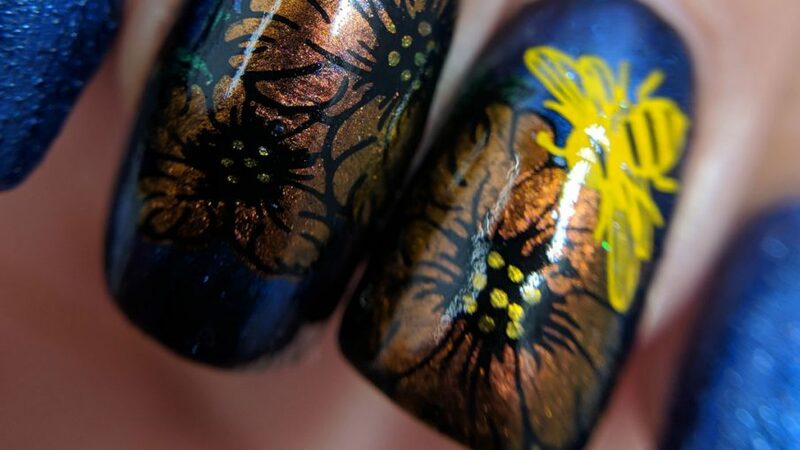 Duochrome Butterfly. Background is Sinful Colors’ “Truth or LavenDare”. 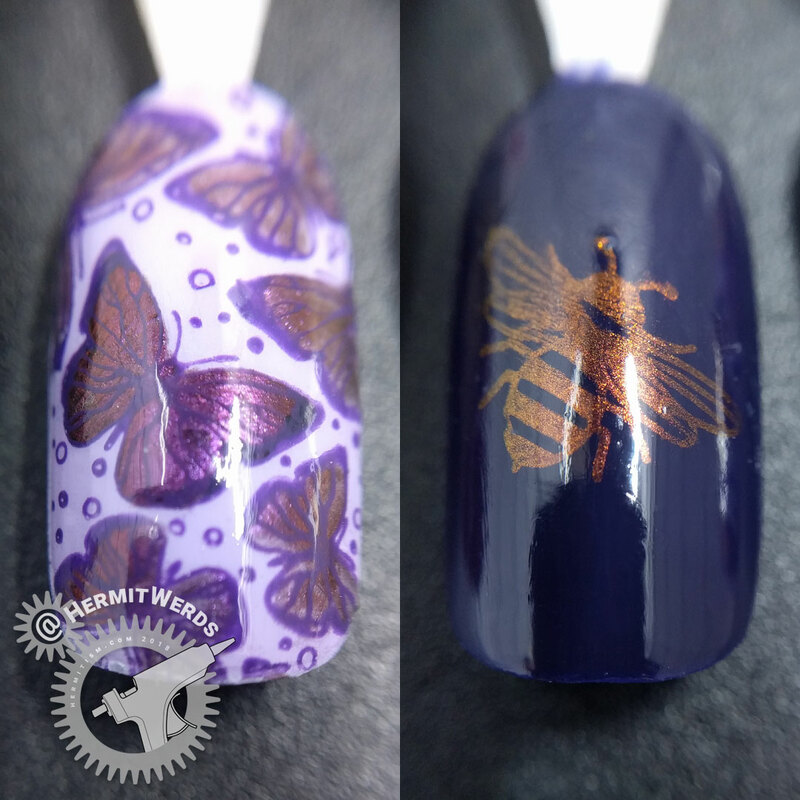 Stamping done with Mundo de Unas’ “Violet” and filled in with Beauty BigBang J6504TM-2A (press sample) and Sinful Colors’ “Black on Black”. I tried to keep the the butterflies a little transparent except for the central one. It worked, but macro shots show all the flaws you can’t see at a glance from a normal distance, so… This sample also proved to me that the Mundo de Unas’ “Violet” polish just isn’t that great opacity-wise. I mixed it up real good this time so it wasn’t patchy, but it was still weirdly watery compared to my other mundos. Duochrome Bee. Background is Jenna Hipp’s “I Cast a Spell on Blue”. 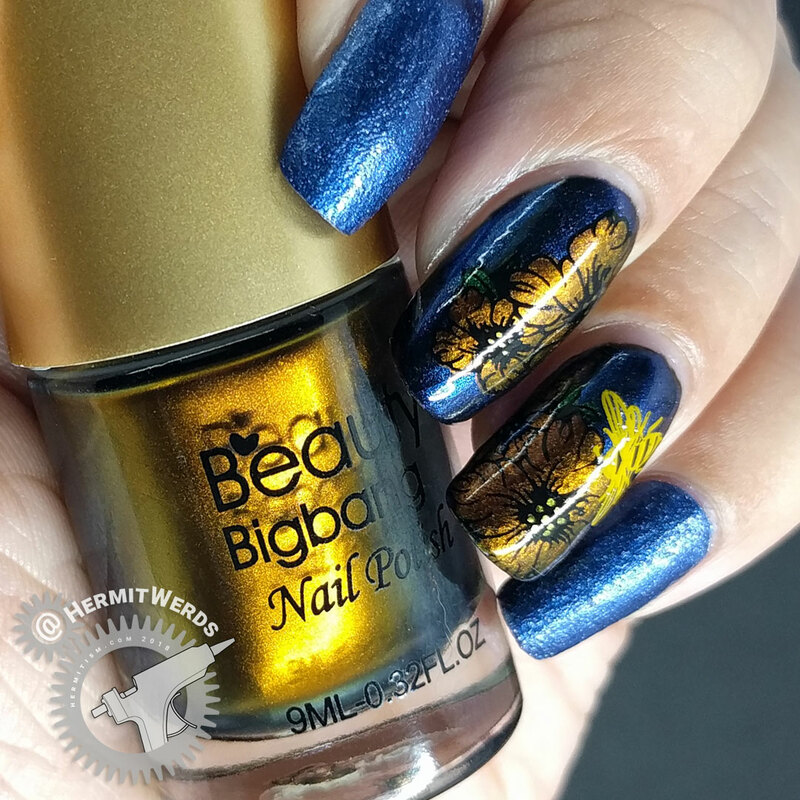 Stamping done with Beauty BigBang J6504TM-3A (press sample). Depending on the angle, the bee was sometimes hard to see which made me wish I could stamp a honeycomb behind it with the duochrome and then have it all solid colored on top while still loving it exactly the way it is. Duochrome polishes: so tasty and mysteries sometimes. Am I right? I answered three questions for myself with this nail art. Do the duochromes work well at filling in decals and that was a yes. If you’re curious what the texture polish I used as my undie looks like by itself, check out this cactus nail art from September. How awful of me. This feels more like a further review of the duochromes than the stamping plate. 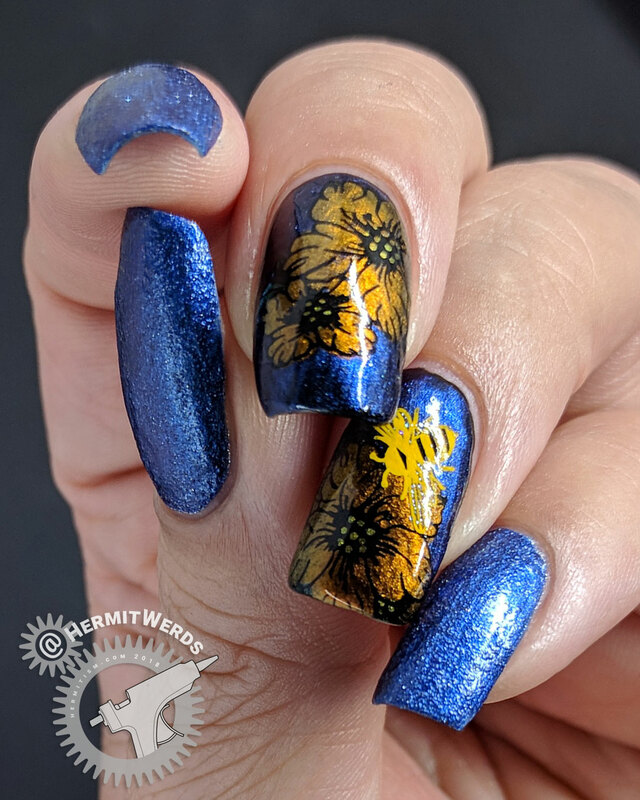 I used all single images for this design and the flower was big enough I could move its position around and make a matching nail art with different looking nails. Really, unless your nails are long and/or wide, there’s a lot of room to play around with some of the images and not have to have each nail look the same. I used the same bee as my sample since I felt the style of the flower called for it. If I’d used the two matching single flowers I probably would have used the more cartoon-y bee. 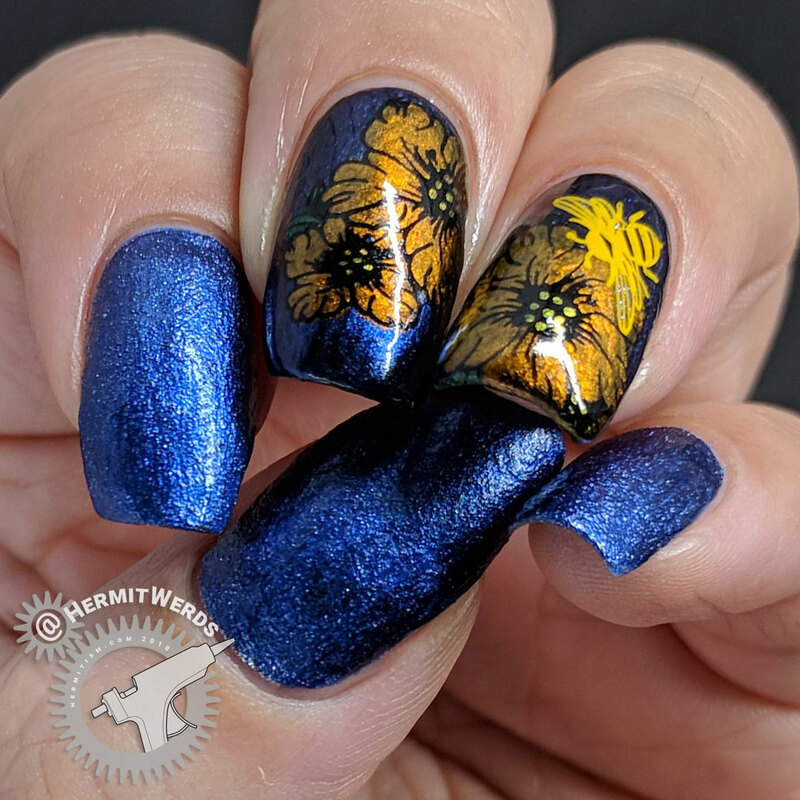 There are lots of really great images on this stamping plate that I’m excited to use, but it’s still not the strongest floral stamping plate out there if you don’t like mixing florals. I was also really happy to find that the duochromes not only look beautiful painted over colorful polish colors, but can layer over a textured polish without eliminating the texture. That opens up a whole realm of possibilities and not just with the duochromes. 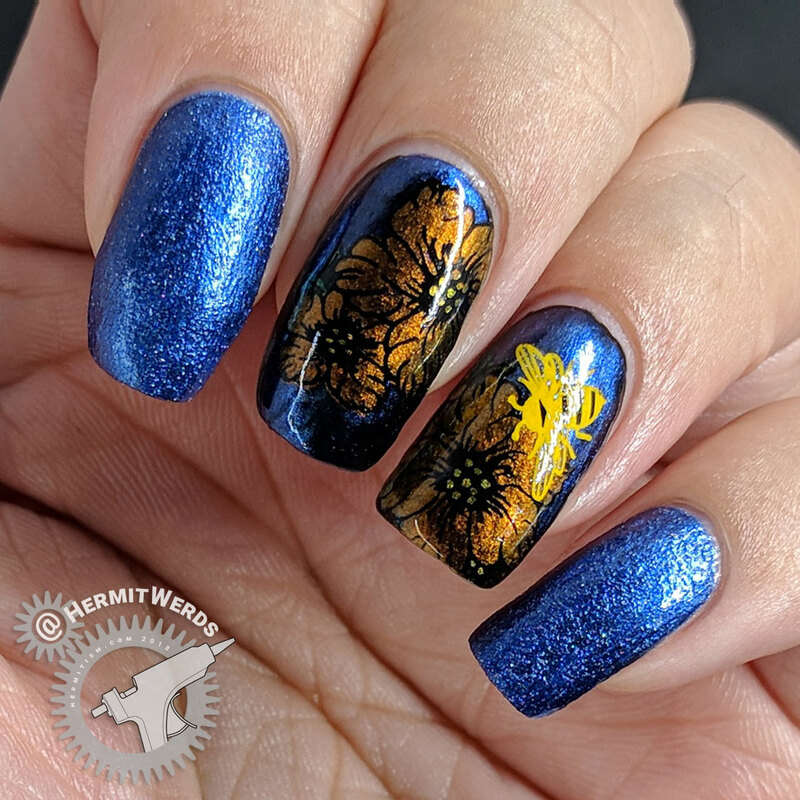 If you’re interested in the stamping plate I reviewed today (Beauty BigBang XL-011) or the set of duochrome stamping polishes (J6504TM) (or the individual colors J6504TM-1A, J6504TM-2A, J6504TM-3A, J6504TM-4A, and J6504TM-5A) feel free to use my discount code (hermi) for 10% off your order. (Non-affiliate code).